Improving diet quality in children with asthma to reduce their risk of having an asthma attack: here we are running a clinical trial in children with asthma where we are examining the effect of increased fruit and vegetable intake on asthma control, symptoms and lung function, as well as inflammation and anti-viral responses. Examining the effects of obesity on the lungs: here we are collecting blood and airway samples from obese people who are undergoing bariatric surgery, such as gastric sleeving/banding. This will allow us to understand the changes that occur in these patients, which may ultimately lead to the development of more effective treatments to improve the metabolic profile and reduce asthma risk. Dietary fibre as an anti-inflammatory treatment for asthma: laboratory models show that consumption of soluble fibre reduces airway inflammation. We are conducting clinical trials and examining whether soluble fibre improves the amount of healthy bacteria in the gut, which can enhance the immune system. Fatty acids as a cause of increased airway inflammation and reduced bronchodilator responses in asthma: we have previously discovered that a high-fat meal causes an increase in airway inflammation, which worsens asthma. We have also discovered that Ventolin doesn’t work as effectively following a high fat meal. Now, we are conducting a series of experiments to understand whether all types of fat are problematic and whether all types of bronchodilators are affected. Healthy lungs are something that most of us take for granted. For many people – both adults and children – breathing doesn’t come easily and this has a debilitating effect on their quality of life. I’m fascinated by the idea that nutrition can modulate the immune system and I really enjoy designing clinical studies to investigate how this can be used to help people with respiratory disease. To develop comprehensive dietary guidelines for adults and children with asthma, to assist with disease management. To offer people with respiratory disease alternative ways of managing their symptoms, other than purely relying on the medications that they have traditionally used. Professor Wood is a nutritional biochemist who graduated with a BSc (Hons 1 and University Medal) from University of Sydney, then a PhD in Nutrition from University of Newcastle in 2001. Following nine years as a research fellow, she accepted an ongoing academic position and is currently Professor in Biomedical Science and leads the nutrition research team in the Priority Research Centre (PRC) for Healthy Lungs and the Grow Up Well PRC. Professor Wood is an experienced clinical researcher whose research research has focused on providing high quality scientific evidence to inform management guidelines for respiratory disease. She has been investigating how dietary factors modify oxidative stress and inflammation, with a particular interest in fatty acids, fibre, antioxidants and obesity. 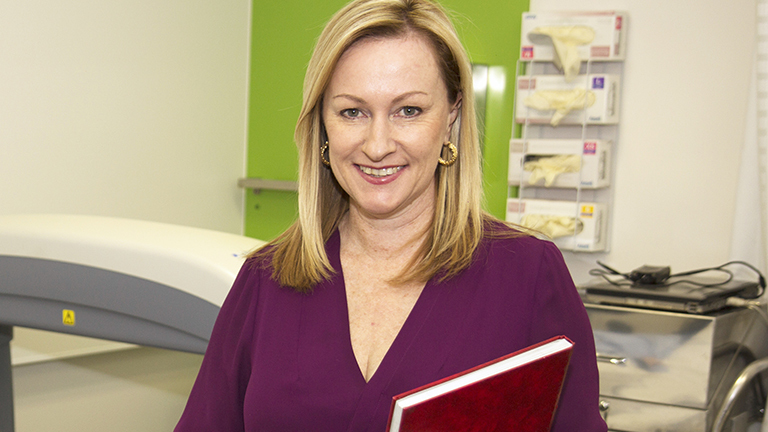 She has established and manages dedicated clinical facilities at HMRI including a specialised Nutrition Laboratory to conduct clinical nutrition intervention trials and a DEXA machine for body composition analysis. She has also established and manages specialised laboratory facilities for the analysis of nutritional biomarkers: HPLC (for antioxidant analysis) and GC (for fatty acid analysis). Professor Wood has published >100 papers in international peer-reviewed journals and her work is highly cited. She has co-edited a book titled ‘Nutrition and Physical Activity in Inflammatory Diseases’. She has also authored several book chapters, a government report and is the inventor on two patents. She has been awarded various local, national and international awards, including a University of Newcastle, Vice Chancellor’s Faculty award for Research Excellence (2012), Hunter Children’s Research Foundation Research Mentor of the Year (2011), Nutrition Society of Australia Research Award (2011), Thoracic Society of Australia and NZ & National Asthma Council Prize for Best Presentation (2010), HMRI Early Career Researcher of the Year Award (2009), NSW Young Tall Poppy Award (2008) and NSW Office for Science and Medical Research Postdoctoral Award for Excellence in Medical Research (2007). Professor Wood plays serves as President Elect of the Nutrition Society of Australia, Associate Editor for Respirology and is an Editorial Board member for Nutrients and the Journal of Human Nutrition and Dietetics. The majority of people with respiratory disease are seeking advice on how to modify their diets in order to improve management of their disease. However, there has been a lack of high quality scientific advice to inform dietary guidelines in this area. Professor Wood’s vision is to fill this void and provide the evidence needed to develop this advice. She has made significant contributions in this area, demonstrated by inclusion of 5 of her team’s publications in the 2014 Australian Asthma Handbook and the 2013 National Asthma Council brochure series for health professionals and consumers. The burden of asthma in children is unacceptably high. Asthma is the most common chronic childhood disease, affecting more than 10% of Australian children. Inhaled steroids are the most effective therapy for controlling asthma day to day, however, they do not prevent many acute attacks of asthma and many patients and carers are concerned about unwanted side effects, which reduces adherence to prescribed medications. Therefore, alternative strategies for managing asthma in children are urgently needed. The CoreScan application is a software upgrade for the existing Lunar Prodigy Dual Energy X-ray absorptiometry (DEXA) machine located within the clinical trials pod at HMRI. Asthma is the most common chronic childhood disease, affecting 10% of Australian children. Asthma is the most chronic childhood disease affecting 10% of children. The risk of common respiratory illnesses compromising the ability of an athlete to train and/or compete to their optimal ability is well understood by coaches and athletes. Project investigating the developmental influence of immunometabolism in obese asthmatics. Obesity is associated with increased incifence, prevalence and severity of asthma across all age groups.